Circling the block in search of a parking space we’re already in awe of the Oklahoma City Museum of Art’s Chihuly Glass collection. 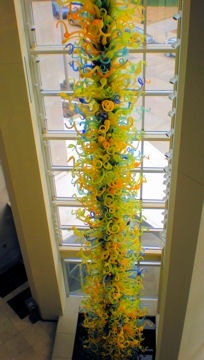 A 55-foot tall glass tower comprised of 2100 separate hand blown glass pieces dominates the atrium entrance. The Kirkpatrick Memorial Tower stands three stories tall on a black granite reflecting pool. This remarkable piece is only the beginning of one of the most comprehensive collections of Dale Chihuly glass in the world. Whether trying to take in the entire tower or studying the multitude of individual pieces twisting and turning in one small segment we’re struck by the artistry and complexity of the structure. As Chihuly admirers we’ve seen many installations of his works in various settings around the country, this is truly an outstanding (and upstanding) original. 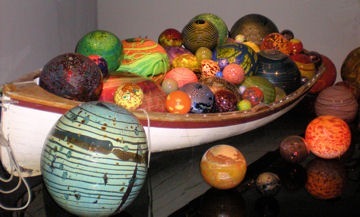 Before researching this trip we didn’t know that the Oklahoma City Museum of Art had such a large collection of Chihuly glass – one of their permanent exhibits. The first time I saw a Chihuly exhibition (in West Palm Beach) I fell in love with the Seaforms; they’re the first pieces I see at the OCMA. 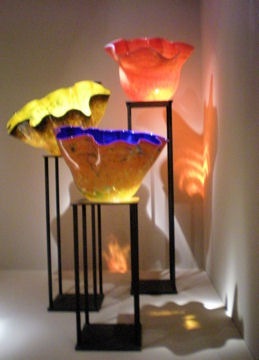 More subtle in color than many of the works, the form and fluid patterns in the Seaform pieces stand out – especially in the dark display cases. I can imagine these creations floating in the depths of the sea. We stop to watch a continuously running video compiled from a number of filmings of the Chihuly crew in action. Watching the teamwork required gives new appreciation. It’s also fascinating to see the variety of installations he’s done around the world and how he ties them into the environment and culture. 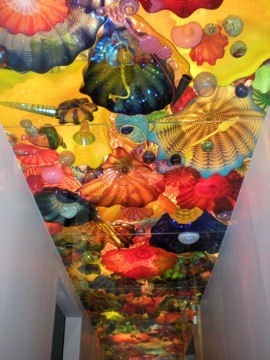 Ceilings are a favorite Chihuly display technique; many admirers have stood in awe of the Bellagio ceiling in Las Vegas. It’s so large and with so many pieces I find it almost impossible to take in. At OCMA the ceiling combines hundreds of pieces from the Persian and Seaform series. I absolutely couldn’t resist the urge to lay down on the floor to look straight up into the layers of color and shapes. I could study this for hours. As one moves under the ceiling the lighting and shading makes each view unique. Again, the wall shadows and reflections are worthy of notice. For more ceiling photos click below. The Chihuly Waterford Crystal Chandelier in the lobby of the Museum’s Noble Theater shouldn’t be missed. 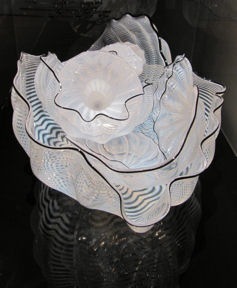 In 1996 Dale Chihuly spent time at the Waterford Crystal factory in Ireland. Working with the glassblowers and etchers there they created two crystal chandeliers. One was hung over a canal as part of the Chihuly Over Venice installation. The other came to Oklahoma City for the Museum of Arts Dale Chihuly: The Inaugural Exhibition and later was purchased by the Museum. His chandeliers have never been among my favorites, some strike me as too over the top. 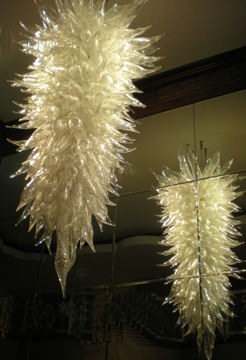 However, the over 200 lead crystal pieces come together in an exquisite work of creative art. The Oklahoma City Museum of Art and all that glass proved to be an outstanding highlight of our Oklahoma art tour. When You Go: The Oklahoma City Museum of Art is open daily except Mondays and major holidays. 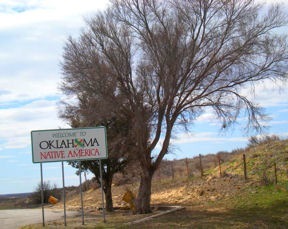 Hearing we were headed to Oklahoma people often inquired why. They would be surprised by how positive, educational and entertaining we’ve found our experiences. We came to Oklahoma City primarily to visit a couple of museum and become acquainted with the community. Mission accomplished. Edgar Cruz Concert – seeing this talented guitarist live in a casual setting was a real bonus; and, he’s as personable as he is talented. A great evening. National Cowboy & Western Heritage Museum – The reputation of this major facility was a major priority on the trip. We expected to spend at least a half day; instead, we arrived 1/2-hour after opening at 10am and where there until closing at 5pm. Many of exhibits deserved even more time. 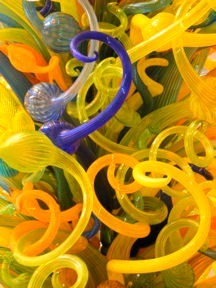 Oklahoma City Museum of Art – The large and comprehensive Dale Chihuly glass collection is a must see. Oklahoma City National Memorial – A sobbering tribute of the 168 innocent victims killed in the April 1995 bombing of the Murrah building. Our visit was too late in the day to also visit the museum but I’m sure it is also very moving. Science Museum Oklahoma – Hundreds of interactive exhibits and activities plus IMAX theater, planetarium, Science Live! presentations and two halls of fame. 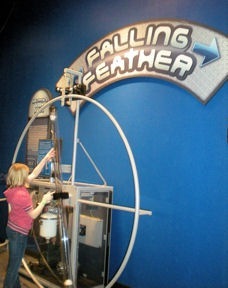 It seemed like every family in Oklahoma choose the Science Museum for the first day of spring break. Mama Roja’s Mexican Kitchen – When the wait Saturday night was 2 hours we went elsewhere; but returned Sunday to good food and margaritas and exceptional service. Staybridge Suites at Quail Springs – So comfortable we extended our stay – and, a great value on weekends. Dining on Persimmon Hill – Within the National Cowboy & Western Heritage Museum, the restaurant offers either a lunch buffet or menu items. Swadley’s BBQ – Recommended by the hotel desk clerk; nothing fancy but tasty and reasonably priced. 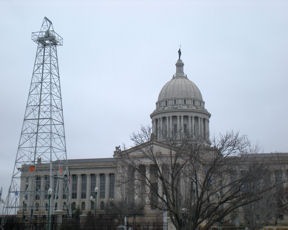 State Capitol Photos – Stopped by the Oklahoma capitol building Sunday morning for photos of the classical structure, on-site oil well and Allan Houser sculpture. Steak ‘n Shake in Edmond – A Steak ‘n Shake visit is always a step back to my youth. If we hadn’t both been fighting colds and I was gimping around with a bad knee reminiscent of Chester on Gunsmoke we would have done even more. Perhaps next time! We made a day trip from Tulsa to Bartlesville combining a hardy dose of Frank Lloyd Wright and an afternoon of Western heritage at Woolaroc, the former ranch retreat of oilman Frank Phillips circa 1925. Price Tower in downtown Bartlesville holds the distinction of being the only realized skyscraper designed by Frank Lloyd Wright. Commissioned by Harold C. Price, the 19-story structure opened in 1956. Today the building hosts offices, The Inn at Price Tower, Copper Bar and the Price Tower Art Center. From Bartlesville we drove westward to the Osage Hills. Although the multitude of trees stand bare the last week of official winter we easily imagine the beauty of the area in leafy green or the colors of autumn. Woolaroc – the name derived from the words: woods, lakes, rocks – encompasses 3,600 acres. Visitors discover a diverse hidden gem featuring wildlife preserve, museum celebrating the American West, Phillip’s historic lodge home, petting barn, mountain man camp, picnic sites and walking trails. No Irish jig, Celtic music or corned beef for us this St. Patrick’s Day. Instead, we spent the day submerged in Western art at the Gilcrease Museum in Tulsa. 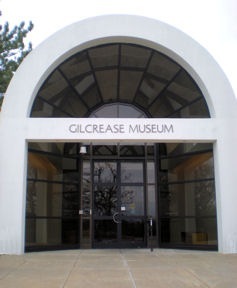 Another day when we thought we would take in two museums but by 1pm we knew we needed the rest of the afternoon to finish at the Gilcrease. 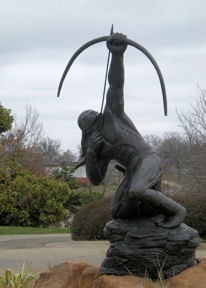 We took a break from the exhibits for a pleasant lunch at The Restaurant at Gilcrease overlooking sculptures in the garden and wooded rolling hills. White table linens, sparkling stemware, initialed charger plates and a professional, well-trained staff create an elegant yet comfortable ambiance. The menu offered interesting options from a bison burger, vegetarian quiche or Santa Fe chicken salad to lobster yellow corn soup. After being buffeted by March Kansas winds and a short stop in Dodge City we turned south towards Oklahoma. The constant wind force stands flags straight out in a horizontal sheet, tall grasses arc to touch heads to the ground in prayer and each passing cattle truck seems to draw the car with magnetic force. We’re reminded of the drought years of the 1930s when the region earned the moniker, “Dust Bowl”. I’m currently reading The Worst Hard Time by Timothy Egan, the story of those who survived the Dust Bowl years. I truly can’t relate to experiencing the same winds carrying tons of top soil, blocking sunlight and thickening the air until one literally couldn’t see their hand in front of their face. Today the land supports cattle ranches and acres of wheat fields in green springtime glory. By late afternoon we’ve reached Oklahoma City and checked into the Staybridge Suites at Quail Springs. In the past year I’ve become a real fan of Staybridge. the separate bedroom is an asset when one person stays up later or is an early riser. the kitchen facilities prove an asset for late night snacks or early morning tea even though I’m not wanting to cook complete meals. I can imagine how much I would have enjoyed Staybridge Suites when we were traveling with young children. We head to the National Cowboy and Western Heritage Museum for a special evening concert in conjunction with the temporary exhibition, Guitars – Art, Artists and Artisans. Oklahoma City’s own Edgar Cruz is playing this evening. The event is free with food and drink available for purchase. We’re exhilarated by the music and well fed with empanadas, pulled pork sliders and roasted potatoes. The evening is a great start for our Oklahoma City visit.